What did André-Marie Ampère Invent? André-Marie Ampère (1775-1836), a French physicist, founded the science of electrodynamics now known as electromagnetism. Danish physicist Hans Christian Ørsted discovered, accidentally, in 1820 that a magnetic needle is deflected when the current in a nearby wire varies - a phenomenon establishing a relationship between electricity and magnetism. During September and October 1820, Ampère, influenced by Ørsted's discovery, performed a series of experiments designed to elucidate the exact nature of the relationship between electric current-flow and magnetism, as well as the relationships governing the behavior of electric currents in various types of conductors. Among others, Ampère showed that two parallel wires carrying electric currents magnetically attract each other if the currents are in the same direction and repel if the currents are in opposite directions. This experiments led Ampère to formulate his famous law of electromagnetism, called after him Ampère's law, that describes mathematically the magnetic force between two electrical currents. His investigations, reported weekly before the Académie des Sciences, established the new science of electrodynamics. He was also first person to develop measuring techniques for electricity in order to perform his experiments. Ampère built an instrument utilizing a free moving magnetized needle (a compass) to measure the flow of electricity. The later refinement of this instrument is known as galvanometer. Basically, a simple modern galvanometer is an instrument where a free pivoting coil and an attached needle are placed in the magnetic field of a permanent magnet. When an electric current is passed through the coil it experiences a torque due to the interaction of the current with the magnetic field. As a result the coil pivots and the needle is deflected proportionally to the current passing through the coil. The unit of electric current, ampere, is called after André-Marie Ampère. Warning: experiments with electricity should be performed under the supervision of teachers or adults familiar with electricity safety procedures. In order to follow in Ampere’s steps, we first of all have to repeat Oersted's experiment. In 1820 Oersted was demonstrating the heating effects of currents flowing through a wire and a compass needle that happened by chance to be underneath the conducting wire deflected. To repeat this experiment, lay a pocket compass on a table, face upwards. Wait until it points north. Lay the middle of a 30 cm length of fairly thick wire, insulated or bare, above the compass needle, also in the north-south direction. Bend the ends of the wire so that they are close to each other. If the wire is not bare scrape its ends and attach them to the battery terminals. The needle will deflect strongly. Repeat this short experiment with the connections of the battery reversed. The needle now swings in the opposite direction. Influenced by Ørsted serendipity discovery, Ampere deduced that if a wire with a current exerted a magnetic force on a compass needle, two such wires also should interact magnetically. He found that parallel currents flowing, in wires, in the same direction attract each other, while currents flowing in opposite directions repel. These, two first, experiments demonstrate qualitatively Ampere’s Law (Ampère's circuital law). Ampere went on with his inquiries and discovered that the force between two long straight parallel currents was inversely proportional to the distance between them and proportional to the intensity of the current flowing in each. In order to verify this law, he used a simple current balance (an apparatus used to measure the force between two current carrying wires) that consisted of two fixed, straight, vertical and parallel current carriers (wires) and a sensitive spring scale. He was able to adjust the distance between the wires and to measure the different currents through them with a simple compass galvanometer, and to measure the force exerted betwen the wires with his spring scale. Though this setup looks simple, it needs some advanced mechanics skills to implement it. It is also possible to use a modern current balance, instead, for this effect. You can measure currents in the above experiments with a modern ammeter or try the historic Ampere's way. As stated above, Ampere used for his current measurements a magnetized moving needle or compass galvanometer. You can build one or use a commercial compass, but remember that it will not be so easy to get accurate results. Another idea: you can build such a device (commercial or homemade compass) and experiment with it. You can try to find what is its precision in relation to modern current meters. You can try different wires (cross-sectional area, material) and different number of coil wraps. 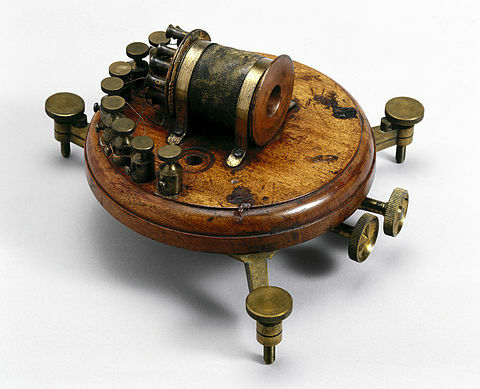 Basically, the moving needle galvanometer Ampere used was a compass wrapped with a coil of wire. The stronger the current that passes through the wire, the greater the needle will be deflected. Or more correctly, the tangent of the angle of deflection of the needle is proportional to the strength of the current in the coil and that’s the reason that these meters are called tangent galvanometers.